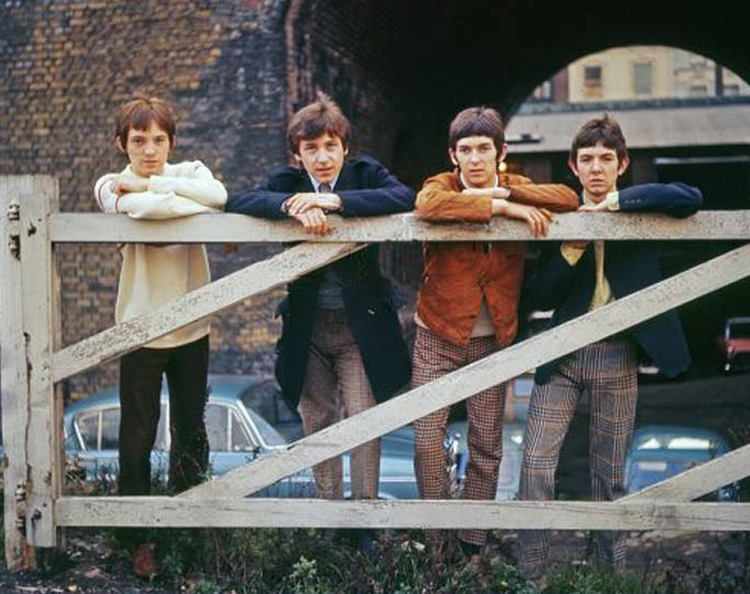 Small Faces were formed in 1965, and when I heard ‘What’Cha Gonna Do About It’ on the radio a month or so later I also heard my future calling me, though I didn’t realise it at the time. I’d been in a blues band, The Muleskinners, and the somewhat jazzy Boz & The Boz People, but was on the lookout for a soulful band that really wanted to make it big when Small Faces’ manager Don Arden called. It was November 1st, 1965. My luck changed that day when I joined Steve Marriott, Ronnie Lane, and Kenney Jones, and we got on so well from the start it felt like we were brothers, mainly because we liked the same music, but equally important we enjoyed each other’s company and had the same sense of humour. “This can’t be happening to me” I thought. But it was. At last I was in a band that wanted to play as much as I did, and we never stopped working and playing together as long as the band existed. We also loved to party, making it the perfect band in my eyes. Although ‘What’Cha Gonna Do About It’ was a minor hit in the UK, the follow-up single ‘I’ve Got Mine’ flopped. The first single I played on was ‘Sha La La La Lee’, which got to #3, and started a run on the charts, culminating in ‘All Or Nothing’ which knocked The Beatles’ ‘Yellow Submarine / Eleanor Rigby’ off the #1 spot in August 1966. Later in November 1966, ‘My Mind’s Eye’ went to #4, but as neither Decca Records or Arden could find their cheque books to pay us our royalties, we dumped them both in early 1967 to sign with Andrew Oldham’s new label, Immediate Records. The songwriting team of Marriott and Lane kept the hits coming through ’67 and ’68. ‘Here Comes The Nice’, a song about a dealer did well for us, but ‘Itchycoo Park’ was the world-wide smash we’d been waiting for. Long being frustrated at the lack of studio time Decca allowed us, Immediate gave us exactly that, and we recorded ‘Tin Soldier’ soon afterwards. A hit in the UK, it only reached #73 in the States, but I’m as proud of that as anything we ever recorded. Following up a hit is always tough, and every successful recording artist has to deal with it in their own way. Immediate forced our hand by putting out ‘Lazy Sunday’ as our next single. Although the song was a private joke, chronicling Steve’s ongoing problems with his neighbours, people seemed to like it enough for it to get to #2, but for us it was bad news. As it climbed up the charts we couldn’t have been more depressed, but we had to promote it as well, and after Tin Soldier’s power and raunchiness it was merely a laugh, but the joke was on us, even though it was just another facet of the many talents within the band. Consequently, it was our second biggest hit, in chart terms at least. It’s strange to think that we were so hard up that Steve, Ronnie and I ended up living together again, this time in half a rented house deep in the country. Steve recorded the basic track of ‘The Universal’ in the garden on a cassette machine, and everything else was added in the studio later, though I’m not on it! When the single only went to #16, Steve was quoted as saying he though he was dragging the band down so decided to leave. He then formed Humble Pie with Peter Frampton, and went on to continued success. This might have been the end of the Small Faces saga if it hadn’t been for fans like Paul Weller, who raved about us and turned others on to us. Even since the band broke up our records have sold consistently, and we’d all be rich boys today if the record industry wasn’t even more corrupt than the movie business or politics. Apparently, if you want to get paid in this line of work you have to sue, which means you have to be rich in the first place. It’s a sad fact that Steve Marriott and Ronnie Lane never saw a penny of their hard-earned dosh from Decca Records, the company that pissed and moaned about paying us a fair royalty, in spite of not paying us at all between 1965 and 1991. Rob Caiger, finally we can say that Small Faces are honoured!